Photosynthesis is how plants store their energy. Cellular respiration should not be confused with photosynthesis! Yes plants can respire also, like we humans can. 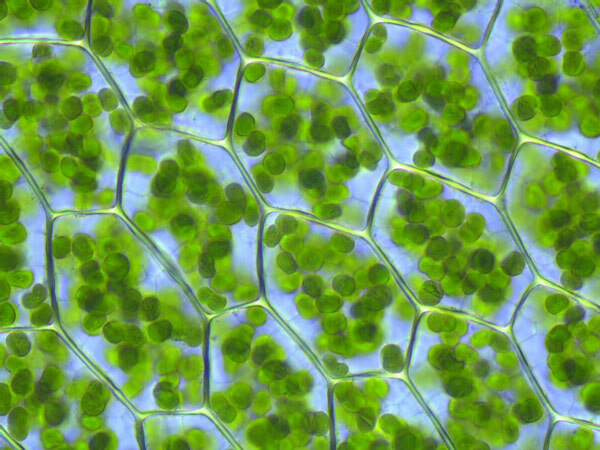 Photosynthesis cannot occur at night, leaving only cellular respiration. Photosynthesis creates the sugar out of sunlight, water, and carbon dioxide. Using bricks of fertilizers or pesticides that don't dissolve. Moving farms away from important waterways. Using carbonate and calcium, rather than nitrate and phosphate chemicals. Using bean and seed legume-crops to enrich the soil. Legumes contain natural fertilizers, like nitrogen. Runoff like sewage or fertilizers add unusually high levels of nutrients to the water. The most significant impact - rather than growth of algae - is the decrease in oxygen dissolved in the water. This is due to several factors including the decomposition of high amounts of biomass. Autotrophs store energy by making nutritional organic substances like sugars. The trophic level with the largest biomass is Primary producers. Highest in the tertiary consumers at the top of the food web. The species at the top of the food web amongst these given examples is the bear. Change the sustainability of the ecosystem permanently. While this has the chance of changing the sustainability of the ecosystem, it does not necessarily mean the system is ruined. Sometimes this is used intentionally to help restore a balance. Predators have more food and eat more, thriving and increasing the number of predators. Carrying capacity: the competition amongst the increased species' population will further reduce their numbers because of the limited nutrient resources. These species have out-competed native species and this has caused a reduction in diversity. These methods are currently used to monitor the populations of many different at-risk species. Can you visually distinguish the particles as a heterogeneous mixture? If yes, then it is a mechanical mixture. If no, then it is a homogenous (solution) mixture. A mechanical mixture contains more than one type of visible particles like pasta sauce, jellybean mixtures, cereal with milk, and the pulp in orange juice. Mechanical mixtures are heterogeneous mixtures. A solution contains more than one type of particle that are not visible or distinguishable, like the different gases in air (nitrogen, oxygen, argon, carbon dioxide...) Solutions are a homogeneous mixture. This is a bit difficult because most liquids students will say are unpure, aqueous solutions like juices, milks, etc... It is easier to understand a solution between one liquid (water) and any aqueous stuff, like the things mentioned previously. 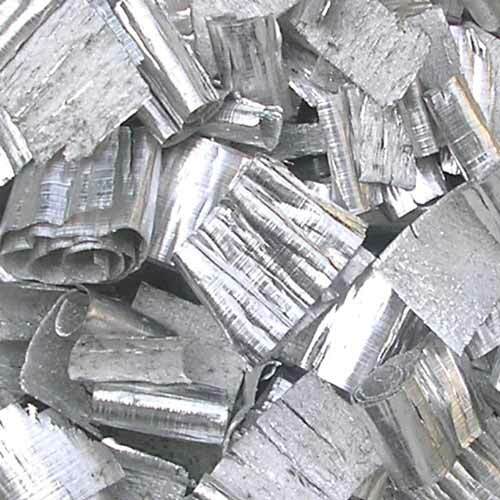 An alloy is a solid solution mixture of 2 metals. The metals are mixed by melting the metals into the liquid state and mixing as a solution. Once cooled to a solid they are in the form you may be familiar with, like brass or stainless steel. Titanium and Gold are the only two mixtures of metals listed in the answer choices. Pure substances contain only 1 type of particle. The H2O molecule is considered as one particle, and any number of these same particles is considered pure. (If the hydrogen and oxygen were separated, then it would not be considered a pure substance because there would be different H2 and O2 particles). Only ice is made up of just 1 type of molecule/particle. The rest of these things contain 2 or more different particles. Coins are now made of a combination of different metal elements. Paper contains cells that contain millions of different kinds of particles. Wood is made of cells that contain millions of different kinds of particles. Soap contains many different kinds of particles. Ice: is PURE WATER H2O and is the pure substance. Gases particles are farthest apart because the heat and kinetic energy overcomes the forces of attraction between the particles. Qualitative properties are observations and do not include a numerical measurement like a quantitative property. Qualitative properties are observations and do not include a numerical measurement like a quantitative property. Mass is an example of a quantitative property because it is usually measured. Quantitative observation are observations made by our senses like: sight, smell, etc. You may know that gold is yellow, and that chlorine has a smell. Sodium is actually a shiny, lustrous metal in its pure form. Neon gas is always orange (the different colors in neon signs are actually different gases than neon). Calcium carbonate CaCO3 is a brittle/chalky, white substance with no odor. 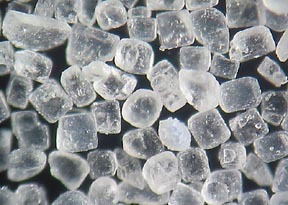 Many ionic salts form an odourless, white solid or powder. Metals - including the alkali and alkaline earth metals - have a shiny luster, are malleable, ductile, and tend to conduct electricity and heat. This may come as a surprise to you that pure sodium (Na) is actually a metal that people eat in food in small quantities called salts. You should learn the difference between chemical changes and physical changes (or chemical properties and physical properties). A chemical change is when the atoms/bonds rearrange in some way. The observational evidence that a chemical change has occurred includes: release (or absorption) of heat or light, odour, release of gas or bubbles, a change in colour, or formation of a new solid or liquid. Remember that rusting is a chemical reaction/change because new bonds are formed as the molecules are rearranged. Melting and boiling are physical changes because only a phase change occurs, without rearranging any bonds between atoms. Dissolving a sugar is a physical change, not a chemical change because no bonds are breaking when the sugar dissolves in water. The sugar changes from a solid to aqueous phase. Dissolving a salt is a chemical change because bonds are rearranged when the ionic compound breaks apart from a solid into aqueous ions in the water. H+Cl- and Na+Cl- are both ionic compounds. The solid will form when the room temperature (23˚C) is lower than the melting point. This is tar, which has a melting point at 65˚C. The process of turning a gas to a liquid is called condensation. Fluids expand to fill their container and have no fixed shape... this can be either a liquid or a gas... Many people don't realize gases are fluids (maybe because they confuse with the word liquid). Materials with higher densities than the fluid density, will sink to the bottom because of gravity. First calculate the volume: Then calculate density: Since the density of the object is higher than the fluid, then the object will sink. (Don't accept mass or volume). Water is one of the few substances in the universe that is more dense as a liquid than as a solid. A 100 kg dinosaur bone is found in the desert. Familiarize yourself with the periodic table. Elements are the most basic unit of a substance and cannot be divided into other substances. Steel is an alloy made of more than one element. Atomic number, the number of protons! A row on the periodic table is called a period. A column is a group. Elements that share a group are in the same chemical family and share physical properties because they have the same number of valence electrons. The chemical property is based on the number of valence electrons that elements in a certain group have. Because elements in the same group tend to share similar physical and chemical properties. Both Neon and Argon are in group 18. Elements in the same group tend to share similar physical and chemical properties. Elements with atomic numbers 1, 3, 11, 19 are in the same group, group 1. The main names are: alkali earth metals (group 1: Li, Na, K...), alkaline earth metals (group 2: Be, Mg, Ca...), ..., halogens (group 17: F, Cl, Br...), and noble gases (group 18: He, Ne, Ar...). Alkali earth metals are located in group 1. Alkali earth metals are most reactive in water. This is called a physical property. Noble gases are considered inert, mostly. These are the 7 Metalloids. Metalloids are special elements that have a mixture of properties of metals and non-metals. They are located on a step-ladder (staircase) on the periodic table between the metals and the non-metals. Neutrons are neutral particles found in the nucleus (in the center) of an atom. On the periodic table, going across a period (left-to-right) increases the number of valence electrons on the outer orbit, and going down a group (top-to-bottom) increases the number of energy levels or orbits/rings. Decipher the hidden messages below, given the atomic structures. The atomic mass is always higher than the atomic number. The atomic mass equals the number of protons + neutrons. The atomic number equals only the number of protons. The second energy level can hold up to 8 electrons. Carbon has 4 electrons in the second energy level, the electrons on this outer shell are also known as valence electrons. The atomic number (number of protons) of an atom can never change - otherwise we would be able to convert one element into another, like convert iron into gold! Rutherford shot particles (in the form of alpha particles with a mass) at gold foil, what he noticed was the particles were not all traveling through the gold atoms evenly. Sometimes the particles were being reflected backwards. Therefore there must have been something inside the atom with a significant mass, and this they later found was the nucleus (so they discovered that atoms have a nucleus). The electrons don't have enough mass to reflect the alpha particles. [Not shown.] Your diagram should include the central charges (20 p+, and 20n) and four rings of electrons with 2 unpaired on the inner, 8 (4 pairs) on the second, 8 (4 pairs) on the third, and 2 unpaired electrons on the outer/valence orbit. The innermost orbit on an atom can contain up to 2 electrons. Elements in the same period (row) have the same number of orbits. Electrical conductivity is based on the movement of electrons. An ion is a charged particle that forms from a neutral element when electrons are removed or added. Elements that lose electrons form positive cations. Elements that gain electrons form negative anions. An ion has a charge, either as a positive cation, or a negative anion. Non-metals that gain electrons form negatively charged anions. These elements are located on the upper-left side of the periodic table. O2- (Hydrogen, potassium, and aluminum form cations. Argon does not form an ion because noble gases are inert). When Magnesium loses electrons to form its cation form... It will lose all the electrons in the outer valence orbit (energy level). Magnesium has 2 electrons in the valence that it will lose because it is in group 2. When Sulfur gains electrons to form its anion form... It will gain all the electrons it needs to fill the outer valence orbit (energy level) up to 8 electrons. Sulfur starts with 6 electrons in the valence because it is in group 6A (or 16), so it needs to gain 2 more electrons. The -1 charge comes from the difference in protons and electrons in the chloride ion. Chlorine starts with 17 protons and 17 electrons. When the chloride ion gains 1 electron, it then has 17 positively charged protons and 18 negatively charged electrons. One more electron makes the charge -1. Given some of the details in the tables, determine the missing values. Number of protons is the atomic number... 4. Number of protons tells us the element is Beryllium. +4 protons and -2 electrons makes a +2 charge. Mass number is protons + neutron so... 9. Number of protons is the atomic number... 16. Number of protons tells us the element is Sulfur. Charge tells us there are 2 more electrons then protons so... 18 electrons. Mass number is protons + neutron so... 32. CHCl3 is a molecule or compound consisting of five atoms: one carbon, one hydrogen, and three chlorine atoms. A compound is composed of two or more elements. A compound is not found on the periodic table. Potassium is the only single element listed, i.e. not a compound. (Note that diatomic molecules are not considered compounds.) The seven diatomic molecules you need to know are, "HOFBRINCL": H2, O2, F2, Br2, I2, N2, Cl2. Covalent compounds are formed when two non-metals combine and share electrons. (An exception is like hydrogen ion plus chlorine ion). Ionic compounds consist of a positively charged ion (cation), combined with a negatively charged ion (anion). The cation loses one or more electrons to the anion. The compound contains three atoms and two different elements. An ionic compound is always made up of charged atoms, or ions. Usually an ionic compound consists of a metal cation, and a non-metal anion. The positively charged Aluminum metal ion is the cation, and the negatively charged Oxygen non-metal ion is the anion. The cation is always written first, and the anion last, in the chemical formula of an ionic compound. This year, you only need to be able to identify compounds from their formulas - you don't need to know how to name them. Covalent: non metal + non metal. The chemist heats the compound over very high heat at 300˚C and the compound does not burn or melt. The chemist then mixes the compound with water and it dissolves easily. Ionic compounds have a high melting point and are mostly soluble in water. Covalent compounds have a low melting point, and are often insoluble in water. Covalent compounds will burn at lower temperatures, since the compound did not melt or burn, then it is most likely ionic. The Earth only has one moon. The Moon does rotate on its axis, and it does orbit the Earth. The time it takes the Moon to orbit the Earth (the orbital period) is the same amount of time it takes for the Moon to rotate on its axis. Therefore we always see the same side of the moon, even though the Moon is rotating on its axis. (BTW, the Moon's orbital period, and rotation period is 27.3 days). A satellite travels around a planet. The Milky Way is our galaxy, which contains our solar system (the Sun + 8 planets). Dwarf planets orbit a central star and are generally spherical in shape. Pluto is a dwarf planet because its orbit crosses paths with another larger planet, Neptune. Since Pluto is not the largest mass in this shared orbit, it is only considered a dwarf planet. (A 'shooting star' in the sky is a meteor). Comets are clumps of ice, dust, and rock that orbit the Sun. Determine what is wrong with the following statement. Solution The terrestrial planets are the 4 inner planets, and the gaseous planets are the 5 outer planets. The inner 4 planets are terrestrial (rock-based), while the outer 4 are gaseous based. (There are only 8 planets that orbit the Sun). Both have gravity and spherical in shape. Gaseous planets made of gas, and terrestrial is sold rock/metal based. Change the following scientific notation to 'regular' numbers. You know that the distance from the Sun to the planets is very far. So, the term astronomical unit (AU) is used to simplify this very far distance. One light year (ly) is equal to approximately, 9.5 × 1012 km. The radius of the orbit of the Earth around the Sun is the distance from the Sun to the Earth. Gravity from the Sun prevents the planets in our solar system from going off in a straight path. The surface of the Sun is, relatively, much cooler than its core. Nuclear fusion occurs in the core of the Sun, making it really hot [equivalent in energy to detonating 400 billion megaton nuclear bombs, every second]. But the surface of the Sun is actually nearly the same temperature of the core of the Earth. Approximately 1.3 million Earths would fit inside the Sun. Charged particles (ions) escape from the surface of the Sun, traveling towards Earth. These particles are affected by the magnetic field and enter the atmosphere near the poles. The ions interact with atoms in the atmosphere, and this creates the photons of light that we see as the Northern Lights (Aurora Borealis). The main source of energy is nuclear fusion, of Hydrogen gas into Helium gas, occurring in the core at 15 million Kelvin. 600 - 700 million tons of Hydrogen is converted into helium, each second! The heavier metals produced in the core. The mass of the Sun is largely due to Hydrogen. By mass, the Sun is 75 percent Hydrogen, and 25 percent Helium. Metals make up less than 0.1 percent of the mass of the Sun. The current model of the universe is called the Heliocentric model, in which the sun is at the center of the solar system. The difference seasons are due to the tilt of the Earth, causing the North and South hemispheres to receive differing amounts of light in summer and winter during Earth's orbit. During daytime, the Sun's light rays hit the northern hemisphere of the Earth more directly than the south. More intense light causes higher temperatures––summer. During daytime, the Sun's light rays are weaker in the southern hemisphere as this part is angled more away from the Sun. Describe what is happening (depicted) in the following lunar cycle diagram, where the Moon is shown in different phases orbiting the Earth, in relation to the Sun. During a lunar eclipse, the Earth blocks the light rays coming from the Sun - the Moon is in Earth's shadow. (Also note that a solar eclipse occurs when the Moon is between the Earth and the Sun - the moon blocks the light coming from the Sun). Gravity from the Moon pulls the water on Earth. Gravity is caused by large masses. Objects with high volumes do not always have high masses (this is low density). Gravity depends on the mass. 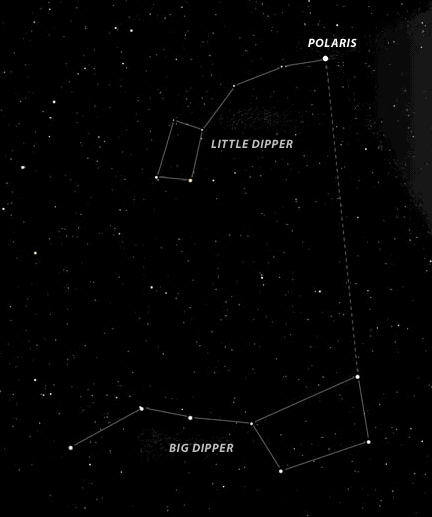 Polaris is the North Star. It is significant because it is located above the north pole in the northern hemisphere, and stays in one place. A satellite is a body orbiting a planet. There are natural satellites such as the Moon, and artificial satellites, such as GPS and radio broadcasters. Objects in a geosynchronous orbit stay in one spot in the sky, relative to a position on the Earth. If you have a satellite television network, next time think that your signal is broadcast up 38,000km and back down 38,000 km for a total distance of about 76,000 km. From hottest to coolest: Blue, White, Yellow, Red Blue is about 40,000˚C, Red is about 3,000˚C. Nuclear fusion is when hydrogen (H) atoms are pressed together under high pressure at the center of gravity of the star to form new atoms of Helium (He) and others. Very high amounts of energy are released from the center of stars as new atoms form. This travels outwards to create a glowing surface, with the difference colors based on the gases and the temperature. Two different light sources, a very bright lamp, and a dim flashlight are held different distances from someone who can see the different brightness of the sources. The perceived brightness of a light source is luminosity. Absolute magnitude is constant for a star and is related to its energy emitted. 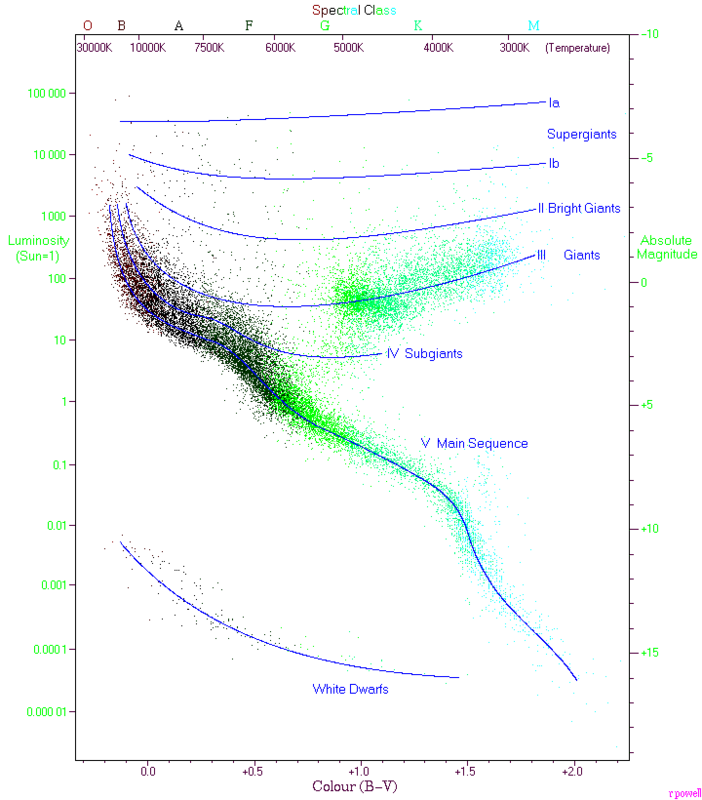 The Hertzsprung-Russell (HR) diagram tells us the color and absolute luminosity of stars. Red giants have low temperature, and high absolute luminosity. White dwards have high temperature, and low absolute luminosity. Our Sun is located in the main sequence. 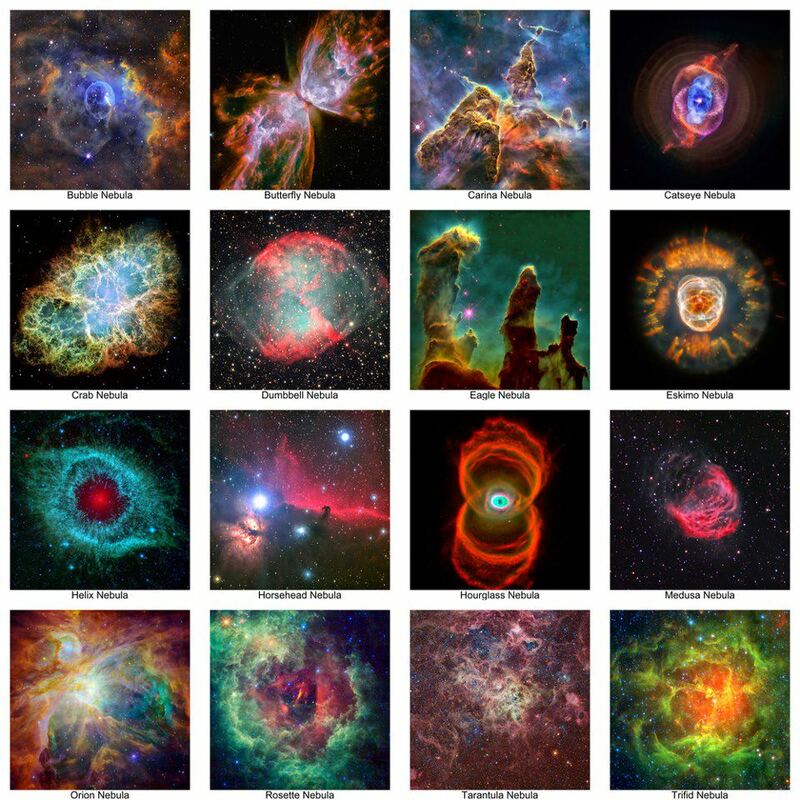 (As an aside, the heavier elements in stars have high gravity, which causes supernovas, which forms nebulas). Stars have different life cycles, based on their mass. A heavy star will consume its resources faster in the fusion of hydrogen into helium. Therefore heavy stars have a shorter life span than the less-heavy stars. Black holes extremely dense bodies formed by extremely heavy stars over 25 times the mass of our Sun. The universe was created in a big explosion in which all matter originated from the center of the universe and continues to move outwards from that center. All matter is moving outwards in the universe. This is absorption spectrum reading is called a red shift and indicates the light is originally from a galaxy that is moving away. Information has been collected that shows galaxies are moving farther apart from one another and that the universe is expanding. (Side note: the universe is not just expanding, it is accelerating farther apart). Electron orbit the nucleus while protons and neutrons are inside (make up) the nucleus. Basically everything can change except for the number of protons. Think about it this way, if scientists could change the number of protons, then they would be able to turn iron into gold! An object is charged when there are more particles of one type than the other type. (number of positive charges) > (number of negative charges). E.g.) A positively charged object could have 100 positive charges and 99 electrons. Positive charges cannot move. The only way to give a neutral object positive is to take away some of its electrons. True. The paper is charged, and then the charged ink particles stick to the paper, and it is heated and fixed into place. The surface to be painted is attached to an electricity source (of negative electrons). The paint particles are given a positive charge so they are attracted to the surface. The law of electric charges states that opposite charges attract. The grounded object is connected to Earth, which acts as an infinite absorber or source of electrons. When a negatively-charged object contacts a grounded object, the excess negative electrons are conducted through the grounding into the Earth. Effective and safe transmission of electricity requires the proper use of conductors and insulators. The transmission of electricity is due to the movement of electrons. Gold is a conductor because its atoms have free electrons that can move and conduct electricity. Plastic acts as an insulator to keep the electricity in the metal wire wrapped inside. The transmission of electricity requires the presence of free electrons or charged molecules. The ions in salt water form an electrolyte. Electrolytes can conduct electricity. Lightning is the result of electric discharge between the bottom of a cloud and the ground. The molecules at the top of a cloud collect positive charges while the molecules at the bottom of a cloud collect negative charges. When the size of the charge imbalance gets high enough, the negative electrons on Earth are repelled leaving a positive charge at the Earth's surface. The negative charge in the cloud and positive charge on the ground cause a release of electrons (electric discharge) from the cloud, through the air as lightning. The 3 main quantities in an electrical circuit are resistance, potential difference, and current. A load converts electrical energy into other forms of energy like light and heat in a lightbulb, or kinetic energy in a motor, or just heat in a resistor. The electrolyte in a battery creates current. In a circuit the real particles moving are electrons, which flow from the negative to the positive terminals. However, due to history, the direction of current is the flow of positive charges (which we know doesn't actually happen). Electrical generators do produce alternating current (AC), but they can also produce direct current (DC). The electromotive force (emf) of the source is constant. Potential difference in series is the sum of each load. Adding loads in series will decrease the potential difference in the existing loads. Current is constant for loads in series. Decrease the total resistance in the circuit... Resistances added in parallel decrease the total resistance. Potential difference is unchanged in parallel. Different instruments are used to measure current, potential difference, and resistance. Parallel paths share the same voltage. Loads on paths in series share the same current. Current is the flow of charges (electrons) over time. If the flow of current is too high, then this could be dangerous and a protective fuse will disconnect the circuit to stop the flow of current. Answer the questions using the relationship with potential difference (V), current (I), and resistance (R) below. Electromotive force (emf) is the volts in the source, like a battery. If V increases and R stays the same, then this means I increases. For resistors in series, current is the same in each. Calculate the current (I) in just one of the resistors: Therefore the current in each resistor is 2 Amps.